Have you been to South Korea? Have you seen and had friends/family that raved about the Myeong-dong district? Chances are, they are probably raving about Korean skin care and that is at the center of it in Seoul. It's not just there, but all over the world and I'm so glad products from the land of the morning calm are now accessible in the Philippines. I usually buy them off drug stores here in Manila and use them before I go off to sleep, probably like the rest of you guys. Skin being the largest organ should always be taken cared of because it actually tells how you take care of yourself, nobody wants to look old like a prune right? JW CreaGen, a well respected Korean pharmaceutical and cell therapy company came out with Dermairis Mask so you could achieve a that Korean glass skin. It's the state that is mostly sought after by consumers in Korea that makes it all well hydrated and almost translucent skin. KPOP stars, KDrama actors and actresses often appear like they don't have pores, almost flawless by any standards. The thing that makes this effective is a combination of technologies in cosmetic and pharmaceutical work they put into it. Particularly the JW-EGF (CTP-EGF) and AMF (Artificial Moisturizing Factor) which is the way they moisturize the skin, and EGF or Epidermal Growth Factor that hastens cell and skin regeneration. They even patented it. Dermairis Mask employs 4 in 1 skin benefits starting from Moisturizing, Anti-wrinkle, Skin Elasticity and Whitening. They have different components in one facial mask that takes care of these problems and takes care of it if you use the product twice a week for 4 weeks to have about 25% of proper moisture on your skin, then keeps it in. For those who want to have this on their regimen, you may purchase this at leading skin care shops, wellness stores, skin clinics and more. 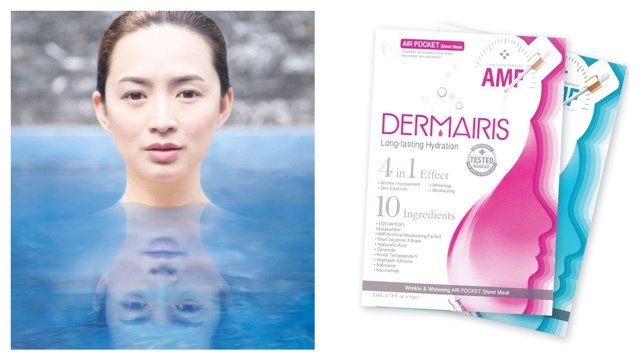 It's available in 2 variants, the Dermairis Blue which has got air pockets that contain nutrients and retails for only Php 70. and the Dermairis Pink which has soft microfibers which retails for Php 150. I would get both if I'd get my hands on it. We need to look good you know! We don't have to look old just to say we're matured. Men need it too.